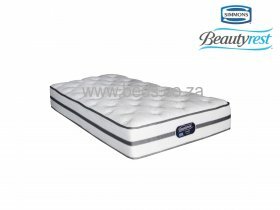 The Simmons Beautyrest Classic Firm is a great option for those looking to purchase a top quality firm Simmons mattress at a value-for-money price. Legendary Beautyrest® Pocketed Coil : provides optimal back support and motion separation for undisturbed sleep. High Density Beauty Foam®: provides comfort and surface contouring. Non-allergenic Wool Fiber : helps dissipate heat thereby maintaining ideal sleeping temperature. Aircool® Comfort foam : has channeled surface design to promote airflow through the mattress. Aircool Beautyedge® Foam : offers both breathability and support and stability right to edge of mattress. Luxurious Stretch Knit Fabric provides delicate soft surface to sleep on. Quilted Non-slip woven fabric backing also provides extra durability to the mattress. No-flip Mattress with Energy Foam™ Base for added stability.